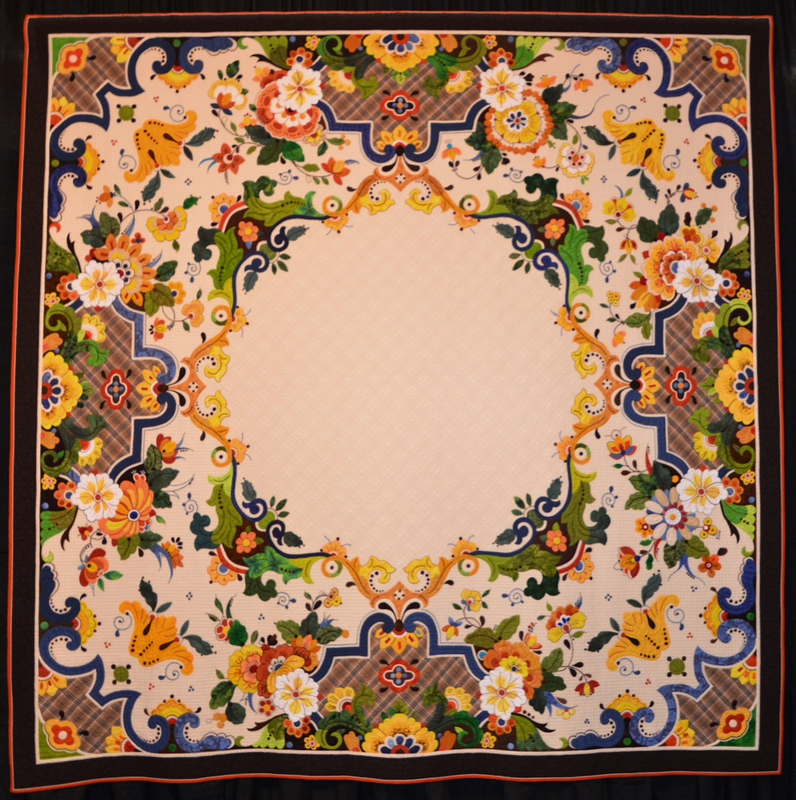 This is the second year of enjoying the breathtaking artistry of quilts at the International Quilt Festival Houston 2012. It was like seeing works of art at a museum. It was sometimes hard to believe that what I was seeing was actually pieces of fabric. My camera loved the quilts so there are many photographs. If you can’t wait to see more, you can visit the Textile Ranger at Deep in the Heart of Textiles. She was there too although we didn’t bump into each other! These quilts were all award winners. For a complete winner’s list and even more quilt pictures, go here. America, Let It Shine by Sherry Reynolds, Wyoming. 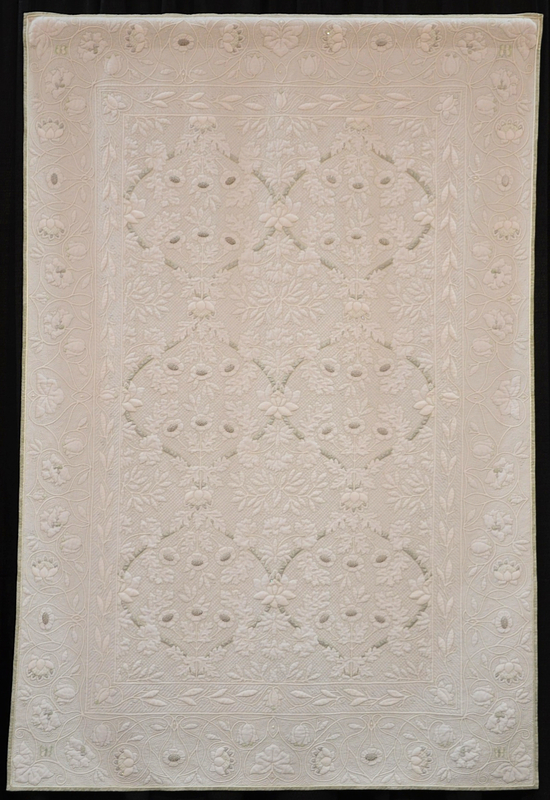 The Handi Quilter® Best of Show Award. ElaTED by Ted Storm, The Netherlands. 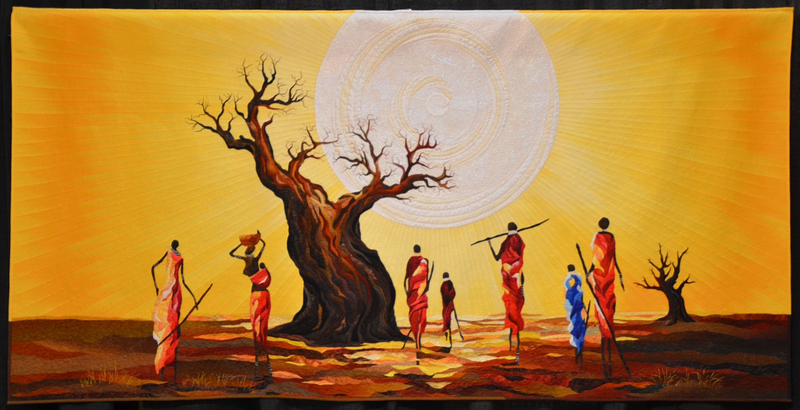 Hot Africa by Janneke De Vries-Bodzinga, The Netherlands. The World of Beauty Award. Crème de la Crème by Bonnie Keller, Chehalis, Washington. Fiesta Mexico by Karen Kay Buckley and Rena Haddadin, Pennsylvania. Master Award for Innovative Artistry. More quilt pictures coming soon. Wow. 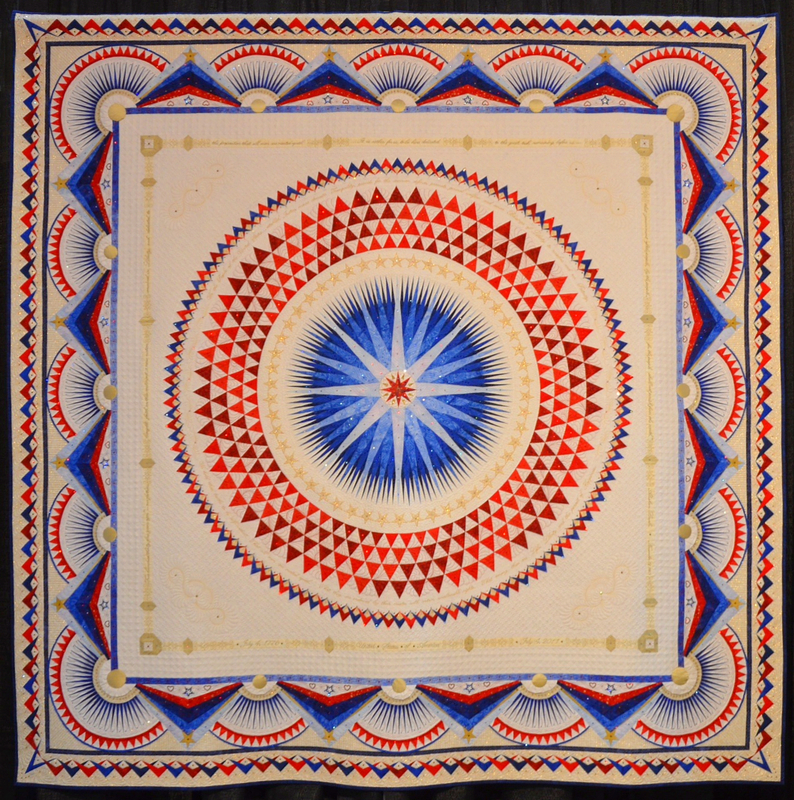 Quilts are so impressive in general; these are amazing. I can’t even imagine the work and skill that went into making one of these quilts. I can’t either. I loved getting up close and looking at the thread and needlework that went into them. Amazing. I have heard so much about this exhibition! Thank you for sharing the experience! I’m so glad I went. It was such a treat. I was actually being a little lazy hanging out at home with no specific plans and just decided to go. For some reason, neither my husband or either o the two teenage boys wanted to go with …? These are really beautiful. Thanks for sharing. You’re welcome. It was wonderful to see them. The exhibit area was huge and I also got in some exercise! That’s the best kind of exercise. Strolling down each isle of quilts seeing more than you can possibly take in, stopping to take more pictures than you can possibly display. (That’s what I do anyway!) I am so amazed at what people can do. I wonder what THEY do at quilt shows? I go home and make brain struggles to picture squares turning into anything but more squares. So continue to share your wealth of pictures and I will continue to admire!!! I didn’t know about the winners being posted on the website! Thanks for the link! Sure! I had to click on a few links but eventually found it. Here I sit, stunned and amazed. Such skill and artistry. I know what you mean. It was also interesting to see the backs. So neatly finished. Glad to. I hope you can see the texture and detail from the photographs. You may need to enlarge them a bit. They were so beautiful and breathtaking. I have always admired quilters and these are outstanding. Thank you for sharing them. They truly were examples of pure craftsmanship. 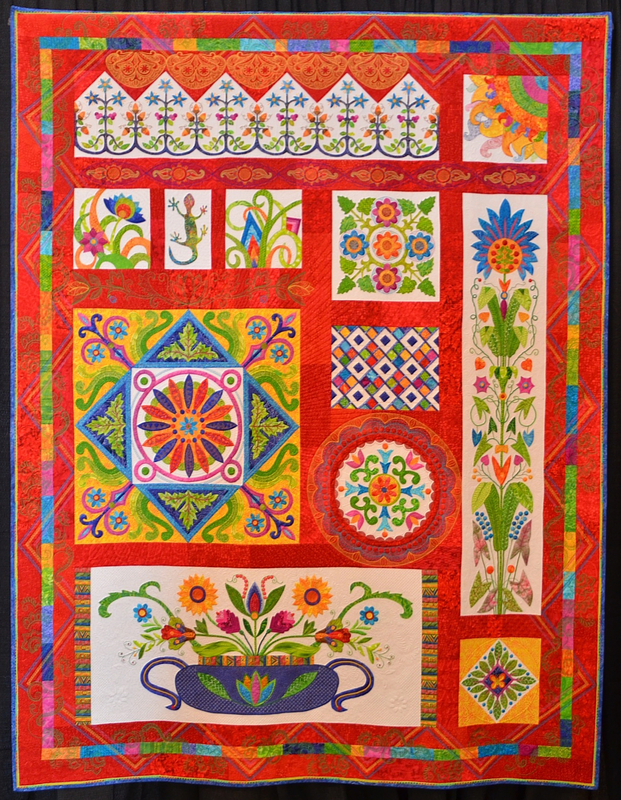 The quilters are so talented to create these masterpieces with pieces of fabric. I was awestruck. wonderful inspiration, thanks for sharing them. glad you and your camera had such a great time. gorgeous. Frankly, it was dizzying. There were quilts everywhere! I kept walking back and forth as different ones caught my eye. Kind of sounds like being inside a moving kaleidoscope. That would be disorienting. Look forward to hearing more from you. I can’t seem to sew in a straight line. Maybe I ought to try a crazy quilt!! Wow. So creative, and I can’t imagine how much work went into those! I can’t either. It also amazes me how you have to compose the idea in your mind, perhaps sketch it out, pick the fabrics and arrange them just so. Amazing. These were unbelievable. It you loved this I recommend googling (or binging) Infinite Variety http://www.folkartmuseum.org/infinitevariety which was an amazing show of over 600 red and white quilts. I’ve tried it and found it remarkably hard to do. For that reason and many others I salute these quilters. They are truly magnificent! I have too and couldn’t quite manage straight lines on a simple block quilt. I couldn’t get the squares and triangles to match up perfectly. Consequently I have a rather ‘interesting’ and ‘uniquely abstract’ design!! !